Santa Fe, New Mexico is an exuberant, colorful, magical journey all year round. Downtown Santa Fe’s streets are lined with numerous art galleries, world-class accommodations, renowned restaurants, and some of the most unique shopping experiences in the United States. Tucked away within the attractive DeVargas Mall, Bodhi Bazaar is among Santa Fe, New Mexico’s finest boutiques. This trendy shop features contemporary, upmarket women’s fashion that has been hand-selected with the same taste and sensibilities of a designer boutique on Melrose Avenue in Los Angeles, California. 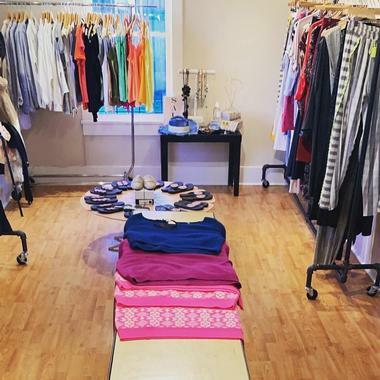 Women of all ages can find their favorite shoes, occasion dresses, designer jeans, and tastefully understated lingerie, all within Bodhi Bazaar. Much of the city’s retail scene features a decidedly conservative and Southwestern bent, but Bodhi caters to women who prefer minis over broomstick skirts, and higher heels with their shoes. While not necessarily inexpensive, the boutique offers a small hub of urbane cool within an otherwise dusty and dry land. Cupcake Clothing is a quaint little boutique that is situated within a repurposed house on Montezuma Avenue in Santa Fe, New Mexico. 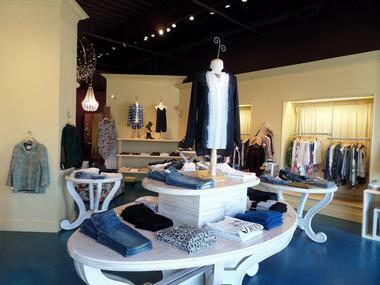 This stylish shop specializes in carrying quality women’s apparel that includes tops, bottoms, shoes, and accessories. The boutique’s friendly staff will make every shopper feel like they’re right at home as they peruse through various selections. 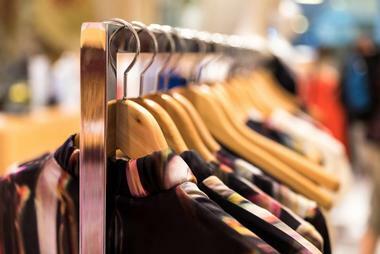 Shoppers will even have the ability to curate and purchase the perfect outfit with a personal stylist without ever entering the store through its online shopping experience. Cupcake will pair each shopper with a stylist, who will then put together a custom wardrobe that is designed specifically to meet their taste and needs. 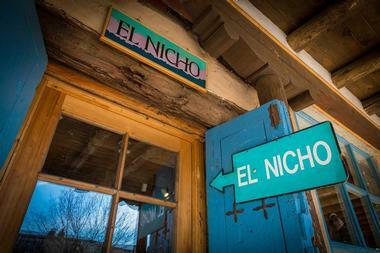 El Nicho is a charming gift shop that has specialized in hand-crafted folk art for more than 30 years. Shoppers will find this little gem of a store located on Don Gaspar Avenue in Santa Fe, New Mexico. It has been one of the city’s most visited and beloved gift shops for several decades. The shop features a lot of hand-crafted Native American and Hispanic Colonial folk art, in the form of wood carvings via the Ortega family, Native American and New Mexican crafts, and Southwestern jewelry. El Nicho purchases all of their inventory directly from the artists, ensuring each piece’s quality and authenticity. Established in 1989, Get it Together is a women’s clothing and accessories store that is sister to the wildly successful shoe store, On Your Feet. Shoppers will find this delightful and casual store located within the well-groomed Guadalupe Station in Santa Fe, New Mexico. The store features a large variety of modern and comfortable collections from European, Canadian, and American designers. Get it Together has been recognized for its hands-on, unique styling and stellar customer service. 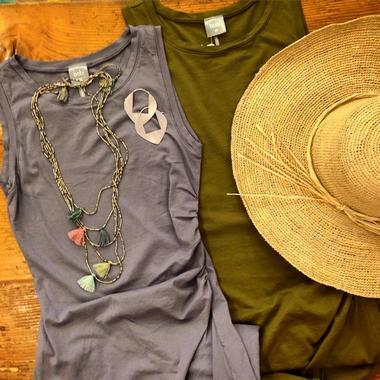 Whether ladies are looking for a rainbow of colors, or Santa Fe’s favorite color, black, this store is sure to have something that will catch their eye, and enhance their wardrobe. Harry’s originally got its start in 1972, and instantly became known in Santa Fe, New Mexico for offering some of the trendiest men’s fashion selections during the 1970s. The brand has evolved over the years, securing a reputation for providing some of the finest men’s and women’s wear – selections with practicality and elegance. The shop is located on a wonderfully-charming street in downtown Santa Fe, near a number of cafés and restaurants, art galleries, and other boutique stores. Shoppers will find everything from office wear to casual wear to fine wear to tuxedoes to evening gowns. Some of the brands offered include Scott Barber, St. Croix, Bugatchi, Tommy Bahama, Jhane Barnes, Zanella, and Canali. HYPERCLASH is an innovative boutique that believes strongly in the principles of reducing, recycling, and reusing, located in Santa Fe, New Mexico. The owner does everything she can to minimize her ecological footprint when designing and creating her clothes. 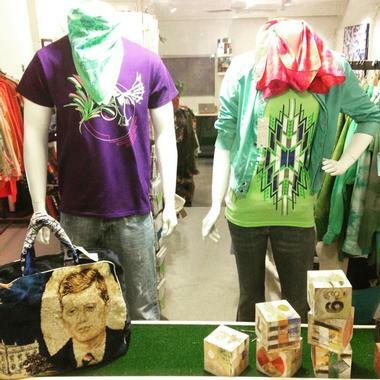 The store primarily uses recycled t-shirts and other reclaimed, sustainable, and organic materials. All of the clothing and accessories within the store have been handmade, ensuring the finest quality, look, and feel. 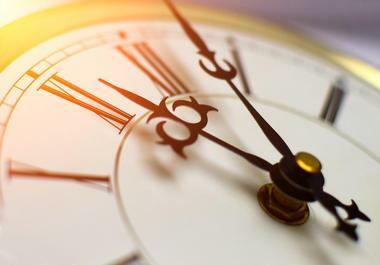 The owner of HYPERCLASH prides herself on using a business model that is vertically integrated, minimizing the need for offshore labor and sub-contractors. Men and women will find everything from jeans to dresses to hats to jackets, along with a variety of accessories. Maya is a clothing and general store that is committed to offering environmentally and socially conscious, unique, fair trade, artisan-made essentials and gifts, in Santa Fe, New Mexico. The shop features an unusual collection of contemporary design to go along with the timeless beauty of items made using traditional craftsmanship. Maya has been serving the locals and visitors who travel to downtown Santa Fe for more than 34 years. Visitors will find everything from unusual kitchen tools to folk art to jewelry to fashion items. It’s a fun store to peruse, where shoppers can splurge on themselves, their friends, or find things for the family – from grandma to baby. Merry Go Round is a family-owned and operated kids clothing store that is located on Washington Avenue in downtown Santa Fe, New Mexico. 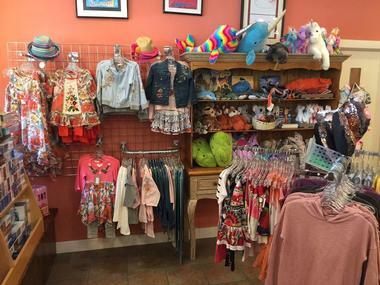 This well-equipped store has been stylishly clothing children within the Santa Fe area for over 30 years. Merry Go Round offers a large collection of specialty brands that include Wes n Willy, Mimi & Maggie, Desigual, TEA, Kickee Pants, and more. Kids will find everything from cute Moccasins and Cowboy boots to fun print t-shirts to shorts and pants. The store offers so much more for children than just clothing, they’ll also find a number of exciting games, fascinating puzzles and books, and must-have toys. The Museum of New Mexico Foundation Shops is a collection of online gift shops that feature specialty items from museums in Santa Fe, New Mexico. Visitors to the site will have the opportunity to shop from a variety of selections from the Museum of Indian Arts & Culture, New Mexico History Museum, Museum of International Folk Art, and the New Mexico Museum of Art. Shoppers will have convenient access to high-quality crafts and arts, collection-inspired products, trademarked designs, and one-of-a-kind gifts. The online catalog has everything from apparel and accessories to home décor to jewelry to books, and more. Shoppers will also appreciate that much of the stores revenue goes back into education, museum exhibitions, and public programs. 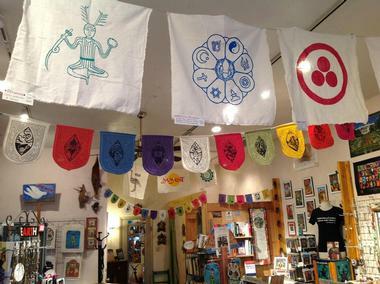 Nambe Store is a gift shop and specialty store that is situated along West San Francisco Street in Santa Fe, New Mexico. The store has been recognized for continuously delivering award-winning designs for over 60 years. 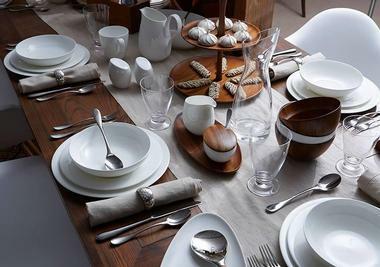 Nambe’s relentless commitment to artistic integrity, uncompromising quality, and timeless beauty are evident within the brand’s impressive collection of barware, serve-ware, gift items, and home décor. Nambe regularly collaborates with some of the world’s most renowned designers to develop essential products that bring both style and function to homes. From the Museum of Modern Art in New York to The British Museum in London, pieces from Nambe are exhibited throughout galleries all around the world. 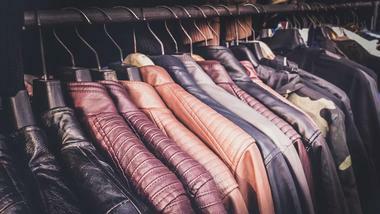 Overland Sheepskin Co. is clothing retailer that is dedicated to shoes and outerwear made from sheepskin, furs and leathers, and high-end accessories, in Santa Fe, New Mexico. Situated at approximately 7000 feet above sea level, and with nearly 320 sunny days a year, Santa Fe blends Anglo, Hispanic, and Native American cultures with its colorful art, rich cuisine, and earthy architecture. The very first store opened its doors in the year of 1973, in Taos, New Mexico. For over 40 years the network of stores has offered sheepskin apparel that has been created with meticulous craftsmanship. Shoppers will find everything from jackets to boots to handbags to hats. Parts Unknown is a large clothing retailer that is located on West San Francisco Street in Santa Fe, New Mexico. Visitors can outfit themselves from top to bottom for leisure, travel, sports, and the beautiful outdoors, all within this upscale store. 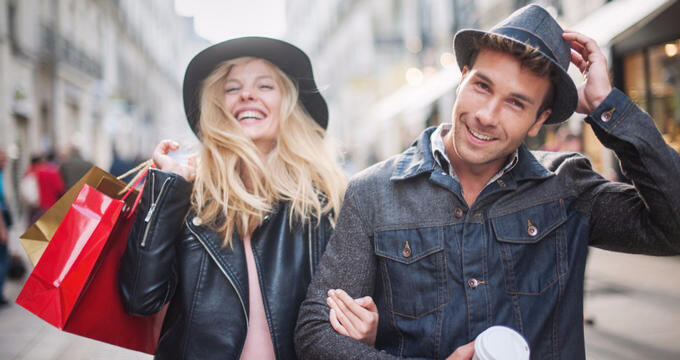 Shoppers can relax instantly with the True Grit or Tommy Bahama lines of ladies’ and men’s apparel; step comfortably in footwear from Old Gringo, OluKai, and UGG; and live stylishly in Not Your Daughters Jeans. They’ll also have the opportunity to accessorize with beautiful, Southwest-inspired wallets, handbags, eyewear, and jewelry from Brighton. Parts Unknown is equipped with knowledgeable fashion experts who provide exceptional customer service throughout the entire shopping experience. Peruvian Connection is a unique clothing store that is situated along South Guadalupe Street in Santa Fe, New Mexico. The store was launched in the year of 1976 by daughter and mother duo Annie and Biddy Hurlbut, after an inspirational experience during an anthropology research trip in Peru. Annie really loved the extraordinary hand-woven ponchos and mantas found in the bustling markets of Cuzco – the Incas ancient capital city. The store’s goal is to offer original, artisan made designs using native Andean luxury fibers, such as alpaca fibers. Shoppers will find everything from sweaters to dresses to skirts and pants to coats and jackets. They’ll also find jewelry, accessories, and home décor. 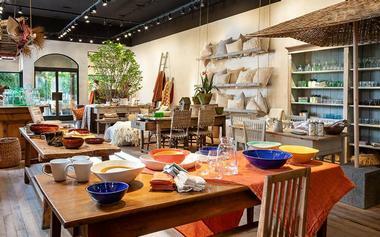 Reside Home is a design-based, home furnishings boutique with a showroom that is headquartered in Santa Fe, New Mexico. This furniture store offers an impressive blend of national brands that include Bernhardt and Mitchell Gold + Bob Williams, paired with unique pieces, all on display to inspire. The store is even equipped with its own private label collection. Visitors will find everything from rugs to furniture, pillows, bedding, lighting, art, and accessories. They believe great design should be easily accessible, the process fun and exciting, and the results as unique as the individuals sharing the space. Reside Home also provides interior design services for those looking to give their home a few upgrades. Established in 1979, Santa Fe Dry Goods is a spacious, high-end clothing store that is located in downtown Santa Fe, New Mexico. Helga and Greig Porter opened the store during a special time when the freedom and aesthetics of the Southwest became wildly popular and fashionable worldwide. 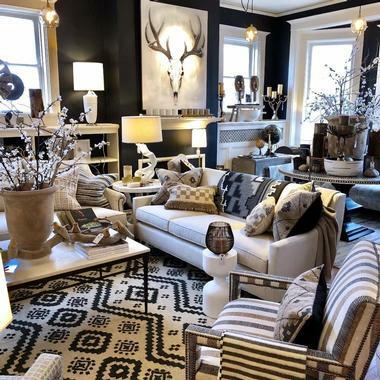 In the year of 2008, their daughter purchased the business from them and set out on a mission to increase the store’s global aesthetic through intentional, forward thinking concepts. Santa Fe Dry Goods has continued to represent designers who explore the unique adaptations of texture, shape, and color. Visitors can peruse the 4,000-square-foot store and find everything from designer clothing to footwear to jewelry to accessories to home goods. Santa Fe Hemp is a clothing store that specializes in pieces and accessories made from hemp, located on East Water Street in Santa Fe, New Mexico. The store has been doing business in Santa Fe for over 21 years, evolving with the fashion trends throughout that time period. They’re dedicated to discovering local artisans and new hemp companies to represent within the shop. 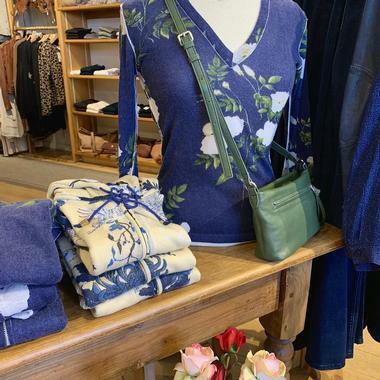 Some of the store’s best-selling items include locally crafted potholders, organic cotton socks, hemp shoulder bags, hemp purses, hemp hats, cotton/hemp blend t-shirts, and several other cool items. Shoppers will also find new and used books, locally-produced music, collectible potteries, hand-crafted gifts, and recycled goods. Santa Fe Honey Salon & Farm Shop, a cherished boutique shop that specializes in various honey products, is located in downtown Santa Fe, New Mexico. Honey lovers will have the chance to experience the full spectrum of aromas, tastes, and even benefits of extra-virgin & unfiltered, raw honey. Working in close proximity with bees for almost a decade, the owners have found that the character of different kinds of bees and their personalities are reflected through their raw honey – a versatile living food. On top of the wide selection of exotic and local honeys, shoppers will find an assortment of fine, honey-based products that include beeswax blocks and candles, skin care products, handcrafted and herbal soaps, and honey drinks. 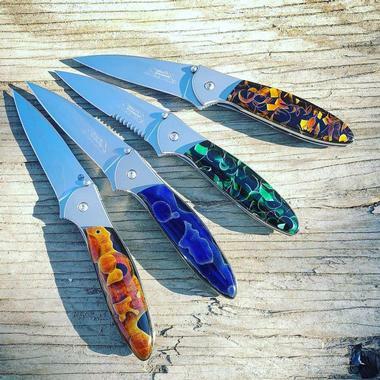 Santa Fe Stone Works is a charming gift shop that specializes in hand-crafted knives, located on Cerrillos Road in Santa Fe, New Mexico. As visitors drive up the entrance to the gift shop, they’ll be greeted by an adobe ranch house that is over a century old, serving as the home for both the production facilities and gallery. There’s an old belief that the house’s robins-egg-blue doorframes and windows ward off evil. As guests enter the main hallway toward the gallery, they’ll pass a brilliant fountain where water bubbles over a large, 300-pound bolder of blue azurite. Some of the knives on display include the Dinosaur Jewelry Collection, Damascus Collection, and the Wooly Mammoth Fossilized Tusk Collection. 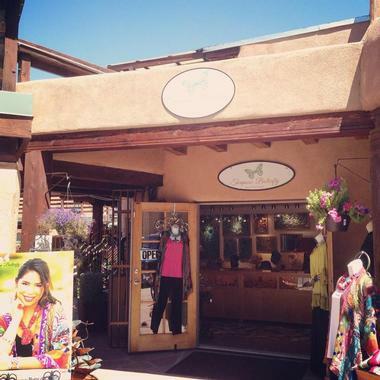 Sign of the Pampered Maiden is a locally-owned and operated fashion boutique that is located at the heart of Santa Fe, New Mexico. The store has been serving the locals and visitors of Santa Fe for over 48 years. The interior of the boutique is gorgeous and unique, offering a relaxing and comfortable space for shoppers to enjoy. The shop is always filled with quality, diverse, and beautiful selections of jewelry, clothing, hand bags, scarves, and other great accessories. Shoppers will for sure feel pampered when here, as the staff is always attentive to any customer’s needs, and are always great resources for putting together amazing outfits. Sunwest on the Plaza is a lovely gift shop that is situated along Lincoln Avenue in downtown Santa Fe, New Mexico. 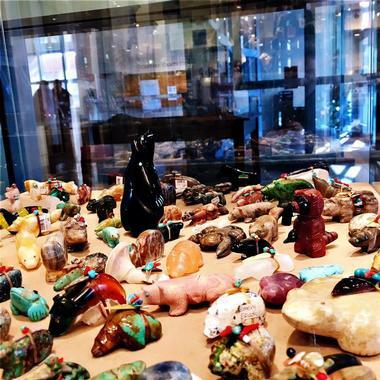 The shop features authentic, handmade, Southwest-style and Native American turquoise jewelry, sculptures and art, and Pueblo pottery from some of the finest artisans around New Mexico. Sunwest on the Plaza has continued to be a trusted Trader within the Southwest since the year of 1972. Shoppers will also find several fun gifts and New Mexico memorabilia, there’s even a Kids Corner where parents are sure to find something special for the little ones. Visitors will definitely want to check out the ornaments, sugar skulls, and curios. 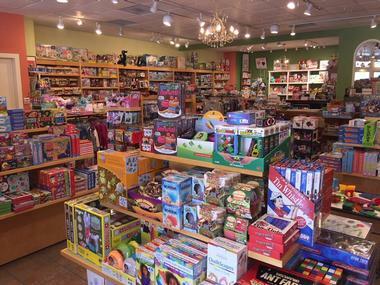 Toyopolis is a family-owned and operated toy store that is located on Washington Avenue in Santa Fe, New Mexico. This toy store has been providing the locals and visitors of Santa Fe with a place to cut loose and have fun for more than 30 years. Toyopolis carries a vast selection of infant and developmental toys, including brands from both the U.S. and Europe. On multiple occasions, the store has been recognized for being ‘Santa Fe’s #1 Toy Store’. Shoppers will enjoy a store filled with entertainment that includes Calico Critters, Playmobil, LEGO, arts and crafts, educational toys, science kits, Brio, and Ravensburger Puzzles. Turquoise Butterfly is an artisan retail business that is situated within a historic adobe building near the Santa Fe River, in Santa Fe, New Mexico. The shop believes strongly in supporting the very talented local artists within the city, as well as finding unique items that shoppers could only find in Turquoise Butterfly. Visitors will find the store packed full of pottery, unusual jewelry, furniture, clothing, one-of-a-kind gifts, and Southwestern art. The store is very active within the community, regularly partaking in, or orchestrating events like the Fashion Show Benefit for the Children’s Miracle Network. As visitors stroll through the old mosaic columns, they’ll take a step back through time as they enter the city’s heart of art. 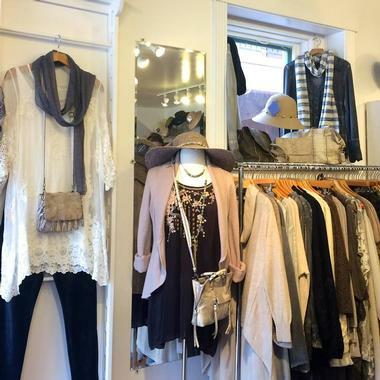 Established in 1986, WearAbouts is an upscale women’s boutique that is located on West Marcy Street in Santa Fe, New Mexico. 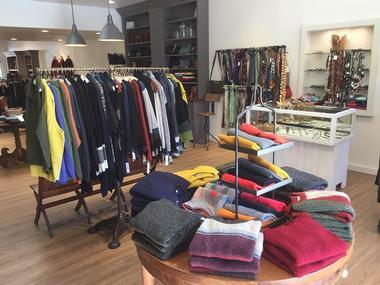 This trendy little shop has garnered the reputation of being one of downtown Santa Fe’s best clothing boutiques. 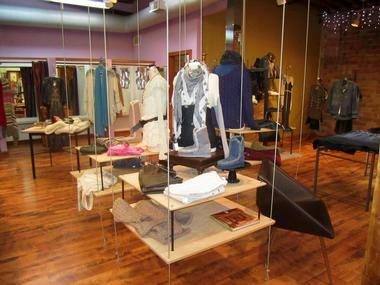 Ladies will find an inviting, fun, and friendly atmosphere within the store as the shop through the many selections. The store specializes in contemporary clothing, offering a number of different tops, bottoms, bags, hats, and other must-have accessories. WearAbouts carries a plethora of hard to find, top brands that include Cino, Chan Luu, Pete, Velvet, LA Made, Michael Stars, Free People, CP Shades, Principle Denim, and Mauritius Leather. Wind River Trading Company is a Native American jewelry store that is located along East San Francisco Street in Santa Fe, New Mexico. The store has proudly been Santa Fe’s premier stop for some of the finest Native American art and jewelry for more than 40 years. The store’s goal is to bring shoppers the very finest Native American-made pottery, jewelry, and additional treasures from the Hopi, Zuni, and Navajo tribes within the Southwest region. Visitors will find the finest quality items from artists on the rise, as well as award-winning artists. 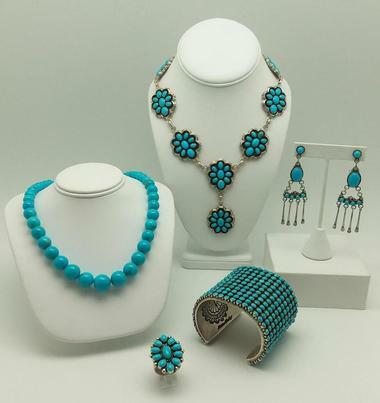 The shop specializes in rare, high-grade, authentic, Native American turquoise jewelry. Visitors are sure to find something they’ll fall in love with here. 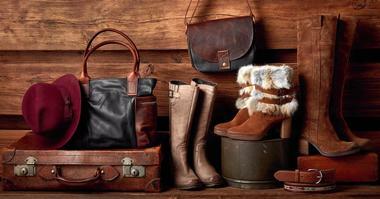 Overland Sheepskin Co., Photo: Overland Sheepskin Co.